Adjectives are words that describe or give more information about nouns or pronouns in a sentence. In other words, adjective describes the quality of nouns or pronouns in a sentence. Adjectives limit the words they describe in some way by making them more specific. For instance, the addition of ‘green’ to ‘car’ limits ‘car’ since it excludes any other car by any other colour. Adjectives tell us something about the colour, size, number, quality or classification of a noun or pronoun. Examples include: red curtains, jet-black hair, brownish eyes, tiny feet, large houses, massive estates, six children, ten questions, twenty-five yards, happy people, delicious meals, mechanical engineering, nuclear weapons, modern languages, Victorian era, etc. Words that come before a noun are modifiers while words that come after a noun are qualifiers. -able: probable, available, laudable, remarkable, palatable, palpable, calculable, insatiable, etc. -al: national, international, economical, statistical, chemical, functional, mathematical, ecumenical, irrational, cynical, comical, mechanical, etc. -ful: hopeful, wonderful, meaningful, careful, beautiful, fruitful, tasteful, useful, faithful, bashful, boastful, lustful, etc. -ish: foolish, smallish, sheepish, youngish, bookish, childish, roundish, girlish, boyish, babyish, churlish, snobbish, etc. -ous: porous, generous, tedious, industrious, meritorious, ridiculous, ludicrous, garrulous, loquacious, pretentious, religious, judicious, salacious, etc. -an: Nigerian, Kenyan, African, American, Ethiopian, Estonian, Algerian, Canadian, Bolivian, Malaysian, Ghanaian, Armenian, etc. -less: listless, brainless, restless, hopeless, wireless, penniless, meaningless, thoughtless, sleeveless, tactless, etc. -ive: invective, submissive, inventive, attractive, intuitive, impulsive, resistive, educative, correlative, repulsive, imitative, retentive, etc. -ic: terrific, ballistic, bombastic, artistic, rustic, drastic, classic, elastic, iconic, exotic, dramatic, aerobic, panegyric, dyslexic, etc. Attraction/attractive, Nigeria/Nigerian, dyslexia/dyslexic, meaning/meaningful, industry/industrious, baby/babyish, child/childish, retention/retentive, ridicule/ridiculous, danger/dangerous, Ghana/Ghanaian, boast/boastful, wind/windy, star/starry, anger/angry, intelligence/intelligent, ease/easy, virtue/virtuous, luck/lucky, pain/painful, etc. Enjoy/enjoyable, help/helpful, sadden/sad, quicken/quick, please/pleasant, persuade/persuasive, permit/permissible, observe/observatory, participate/participatory, anticipate/anticipatory, move/movable, invent/inventive, instruct/instructive, injure/injurious, inform/informative, indicate/indicative, impress/impressive, force/forceful, harm/harmful, disturb/disturbing, etc. Sick/sickly, red/reddish, yellow/yellowish, correct/corrective, elder/elderly, comic/comical, classic/classical, historic/historical, electric/electrical, magic/magical, fantastic/fantastical, poetic/poetical, etc. Diligent people wake up early in the morning. The brilliant girl is equally beautiful. Clever people end up being sought after. The governor elect is here. Our ambassador designate has travelled. The heir apparent is uneducated. Babies with dimples are cute. The elected governor is here. Our designated ambassador has travelled. The apparent heir is uneducated. The poor could be proud. The fearful are not allowed. In this case, the verb that accompanies this is usually a Plural Verb. The music was very mournful. Gradable adjectives are those that can take degrees of comparison: the comparative form and the superlative forms. Examples of gradable adjectives include: soon, clean, etc. Non-gradable adjectives are those that cannot accommodate the comparative and the superlative forms. Examples of such adjectives include: supreme, beautiful, reasonable, handsome, etc. These function the way Possessive Pronouns do. Possessive Pronouns that function as adjectives are called ‘Pronominal Adjectives’. Read more about them on this page. These types are similar to Demonstrative Pronouns. Read more here. The degree of Adjectives can be in three forms; the positive, the comparative and the superlative. This is the absolute form or the adjective itself. This is the first degree. Examples include: short, tall, fat, slim, gentle, clever, candid, intelligent, etc. 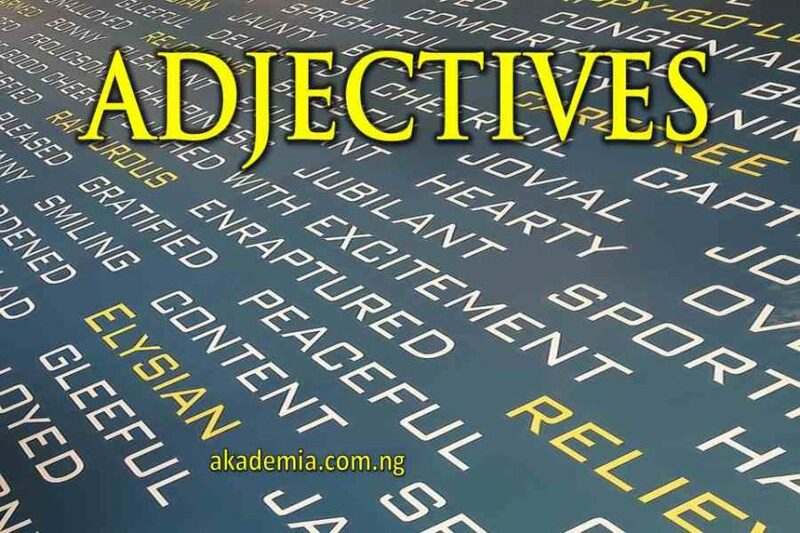 The Comparative is the second degree of the adjective formed with the addition of the ‘-er’ to the positive form for adjectives that can be inflected and attachment of ‘more’ to adjectives that cannot be inflected; for instance; more realistic, more tactful, more brilliant, etc. The correct form that we can inflect is largely an issue of length. Monosyllabic adjectives such as: loud, short, tall, slim, etc. add ‘-er’ to become louder, shorter, taller, slimmer, etc. Adjectives with two syllables have both forms as a possibility as in gentler/more gentle, cleverer/more cleverer, etc. Adjectives with three or more syllables usually form their comparatives with the addition of ‘more’. Note that we cannot use the two forms of the comparative (‘-er’ and ‘more’) together on an adjective. To say, ‘more better’ or ‘more shorter’ is ungrammatical. We use the comparative when it involves two people or groups. E. g.
She is the neater of the two girls. Ade is more intelligent than Uche. The superlative form is the third degree of the adjective and it is usually formed with the addition of the ‘-est’ to the positive form of the adjectives that can be inflected and the use of ‘most’ to adjectives that cannot be inflected; for instance; most elegant, most ideal, most level-headed, most intelligent, etc. Unlike it is in the case of comparative, three or more entities are involved and the superlative (‘-est’ and ‘most’) and cannot be used together on an adjective. It is wrong to say, ‘most best’ or ‘most shortest’. In addition, it is good to note that some adjectives are irregular in both their comparative and superlative forms, e. g.
It is only if they begin with ‘un’ that they are likely to end in ‘-er’ or ‘est’ as in ‘untrustworthier/untrustworthiest’. Some adjectives, by their very definitions, do not normally have a comparative form. They are always in the superlative e. g. unique, best, utmost, optimum, optimal, etc. Read more on other Parts of Speech.